Composite films based from tin dioxide (SnO2) and zinc oxide (ZnO) was synthesized on a glass substrate via spray pyrolysis at a substrate temperature of 350°C. SnO2-ZnO composite films were obtained by varying the volumetric amount of zinc acetate precursor solution (25 vol%, 50 vol%, and 75 vol%). The results of scanning electron microscopy and X-ray diffraction analysis showed an increase in the grain size of the composite film as the ZnO volume ratio increased. UV-Vis spectroscopy revealed a decrease in the transmittance spectra of the composite films with zinc acetate volume concentrations of 50%, which is due to thicker film achieved at 50-50 combination of the films. The optical band gap energy was computed by extrapolating the straight line in the Tauc's plot to zero. The computed optical band gap has a decreasing trend as the ZnO volume ratio increases. A. Bendal, A. Cafe, Y. Rola, E. Suratos, H. Husay, E. Estacio, A. Salvador, and A. Somintac. 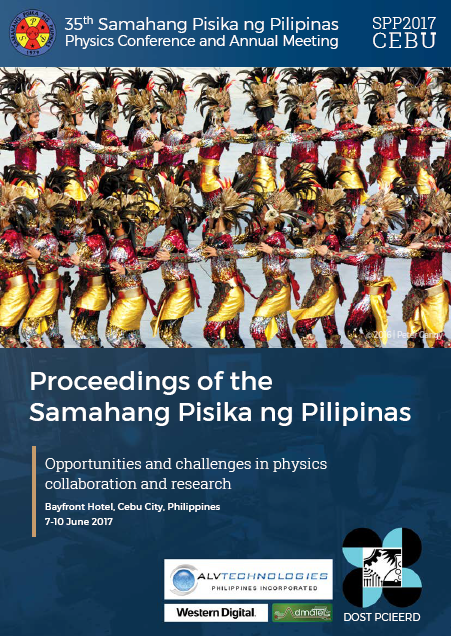 Synthesis and characterization of SnO2-ZnO composite thin films deposited via spray pyrolysis, Proceedings of the Samahang Pisika ng Pilipinas 35, SPP-2017-PA-27 (2017). URL: https://paperview.spp-online.org/proceedings/article/view/219.